This article was written by Murray Mitchell and first appeared in Oakwood and District Historical Society’s ‘Oak Leaves’ in Autumn 2001. We are very grateful to Lesley Mitchell (and her family) for giving us permission to include her husband’s article on this website. [We have added some photographs to the original article for the benefit of those not familiar with the area – please ‘click’ on the photographs and diagrams to magnify them]. It is perhaps hard to appreciate that the built-up area of the leafy suburb of Oakwood in N.E. Leeds conceals the evidence of a once thriving and important quarrying industry. From at least the middle of the eighteenth century until the early part of the twentieth century, quarries in Oakwood supplied high quality sandstones for the building of local houses and some of the fine, commercial buildings in central Leeds. 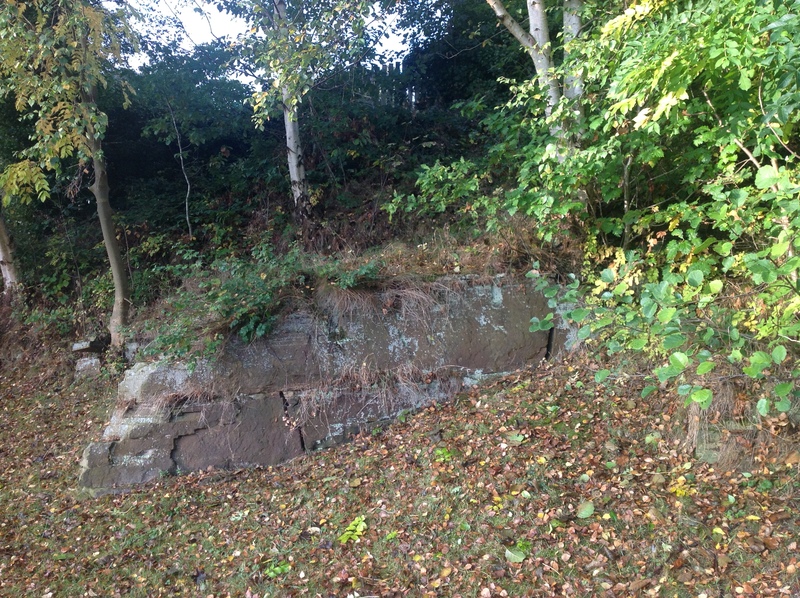 This long history of working the rocks for building stone has left its mark with many local delf or quarry holes. 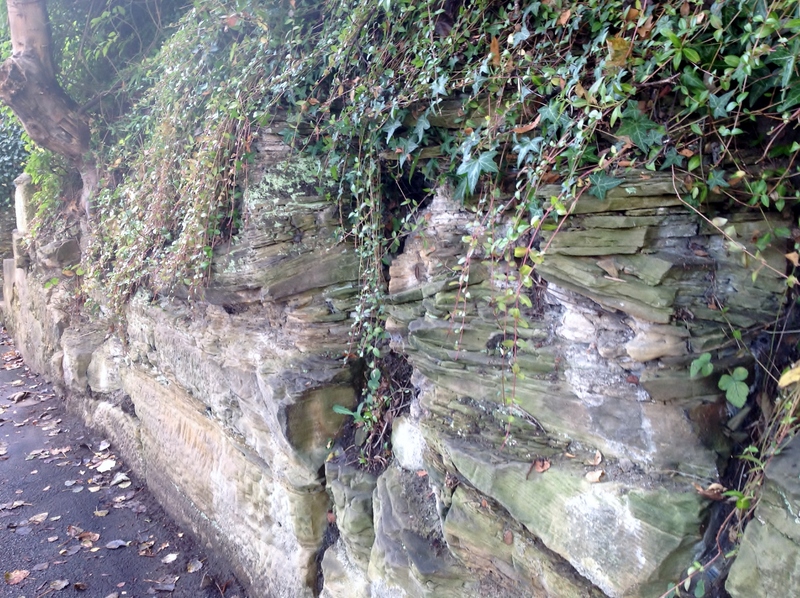 Much of Roundhay is underlain by sandstones of Carboniferous age. 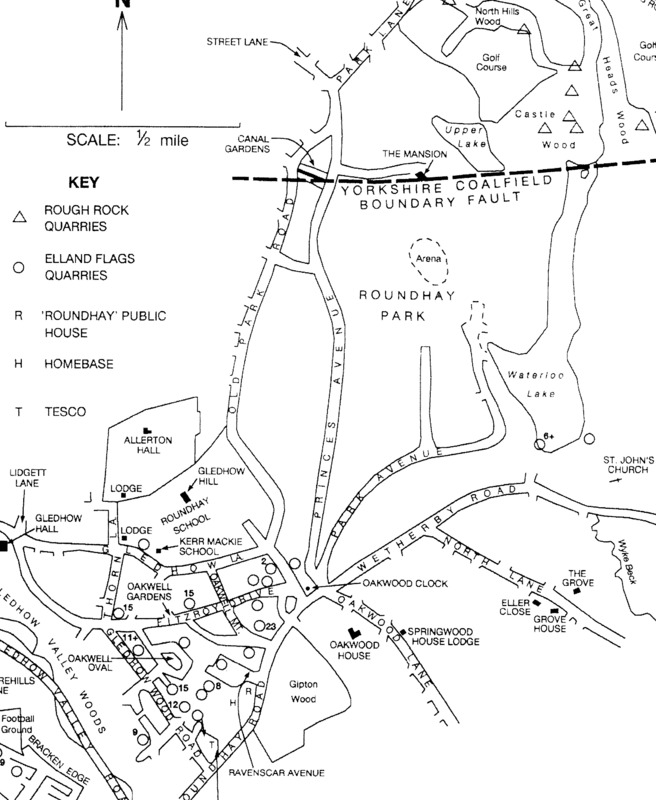 The northern boundary of the great Yorkshire Coalfield crosses the area, and is marked by an east-west aligned fault or fracture, the line of which passes just south of Canal Gardens, and crosses the park immediately to the north of Waterloo Lake (see Figure 1). North of this fault, the sandstones are coarse grained with conspicuous small white quartz pebbles and are the Rough Rock, the highest unit of the Millstone Grit which forms much of the Pennine moorlands. Between the boundary fault and another fault roughly along the line of Roundhay and Wetherby roads, the sandstones are finer grained and are the younger Elland Flags of the lower part of the Coal Measures. 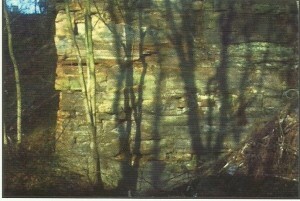 Very little has been written about the quarrying in Oakwood and few documents or records survive. One is dependent therefore on old maps and scattered information to piece together something of this aspect of local history. 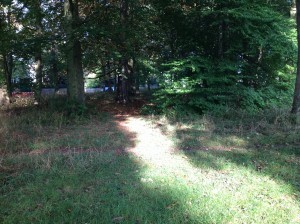 The earliest evidence for quarrying in the area is found on Smithson Dawsons 1774 Plan of the Duke of Norfolk’s estate at Roundhay, and on Jonathan Taylors 1803 Plan of Roundhay drawn at the time of the purchase of the estate by the successful businessmen Thomas Nicholson and Samuel Elam. Both these plans show the names of several fields adjacent to the site of Oakwood Clock as Quarry Closes although no actual quarries are marked. The primary six inch to one mile (6 in) Ordnance Survey (O.S.) was carried out in 1847 and published in 1851. It provides valuable evidence marking the site of many early quarries. Later revisions of the 6 inch maps are helpful in tracing something of the history of how the quarries were extended and later filled in and even built over. 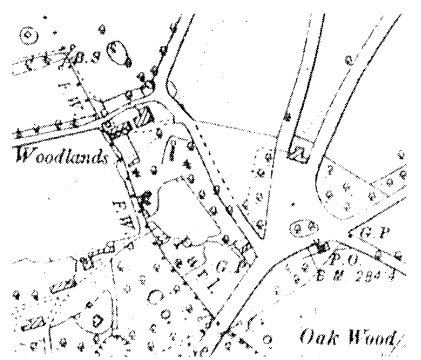 The woodland to the north-west of Oakwood Clock, for example covers the site of a quarry shown on the 1851 map. 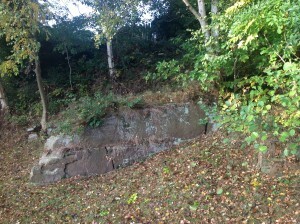 The quarry on the north side of Fitzroy Drive between Oakwell Gardens and Oakwell Mount, here named Oakwell Quarry, is the only quarry to survive as a large open hole with faces up to 15m high (see Figure 2). The British Geological Survey’s Technical Report WA/92/1 (Lake and others 1992) contains Applied Geological Maps of the Leeds area. Map 6 in this Report marks the areas of known quarrying and Map 4 shows the distribution of back-filled quarries with the maximum thickness of fill given in metres (see Figure 1). 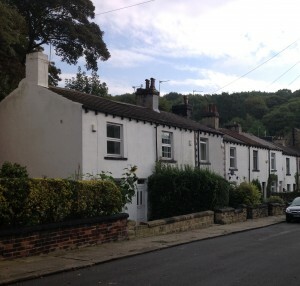 The row of terraced houses in Ravenscar Avenue, alongside the “Roundhay” public house was built in about 1800 for the workers in the adjacent Gipton Wood quarries. (Mr. John Richards, personal communication). Stone from these workings was almost certainly used in their construction. The quarries opened in the Rough Rock are confined to the northern parts of Roundhay Park, in Castle Wood, North Hills Wood and Great Heads Wood, to the north of the Yorkshire Coalfield Boundary Fault. 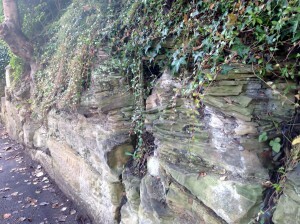 The stone from these outcrops is typically a coarse-grained sandstone with occasional layers of small white quartz pebbles and is from the same geological formation that was at one time extensively quarried in the Bramley Fall, Kirkstall, Horsforth and Meanwood areas of Leeds. 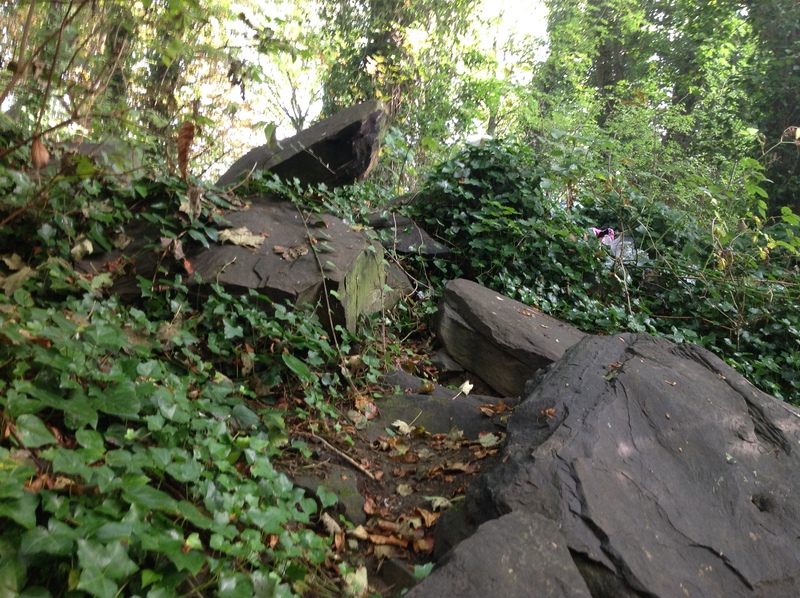 It has a reputation as a durable stone, and was often referred to as Bramley Fall Stone. There are many lasting examples of the use of this excellent sandstone in the buildings of central Leeds (Dimes and Mitchell 1996). The Rough Rock quarries are marked by triangles on Figure 1, and they all came into existence between 1821 and 1847. No information has been traced about the use of stone from these quarries, some of which are relatively small. They would probably have supplied building stone for local use such as walling, and perhaps parts of the few pre-1850s houses of the area. 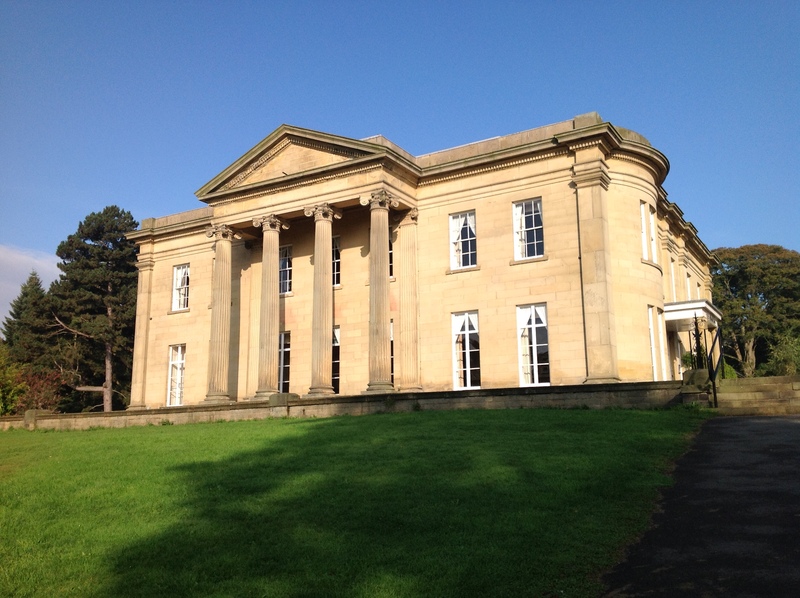 The stable block of The Mansion is built of a coarse-grained sandstone which may be the local Rough Rock, but the main house, dating from 1812/13, is constructed of fine-grained sandstone, very probably Harehills Stone from the quarries in the Oakwood area. The Elland Flags quarries are in the area bounded by Gledhow Lane, Roundhay Road and Harehills Lane where fine-grained sandstone known as Harehills Stone was worked.In the Bradford-Halifax area, much of the Elland Flags is well bedded and splits easily along micaceous partings into 100 -150 cm (4 in to 6 in) thick slabs to produce the famous Yorkshire Flagstones. However, some outcrops of the Elland Flags are thicker bedded and more compact without partings, and can be cut, as they were in the Harehills to Oakwood area, into beautiful worked, smooth-faced and decorated blocks for use as constructional stone. 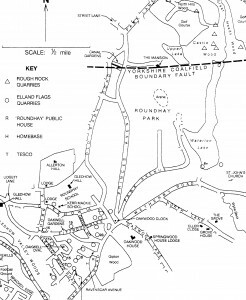 The approximate sites of the Oakwood Elland Flags quarries are shown by circles on Figure 1. Some are shown on the 1851 6 in map, but activities continued long after that date and later maps show the development of these once important quarries. It should be stressed that the extent of these old excavations is shown very approximately. Anyone with queries about foundations is advised to consult expert advice. Most of what is known about the history of Harehills Stone comes from an invaluable entry (about 1863, Vol. 4, p. H22) in the Dictionary of Architecture (1848- 1892) by Alfred Waterhouse, the renowned late Victorian architect famous for his extensive use of Burmantofts Faience. This provides the information on which the present account is based. Waterhouse recorded that Harehills Stone was the name given to the stone quarried at Harehills and Gipton Wood. At the time he was writing, he noted that “some years since there were two quarries worked at Harehills, and another at Gipton Wood and that there is now only one quarry worked at the former, but two at the latter place”. 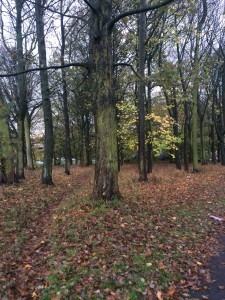 It is difficult to be certain of the sites of these early quarries, but Gipton Wood would refer to the ground on the west side of Roundhay Road behind the Roundhay public house above where the Homebase store now stands. Discarded stone in “Gipton Wood Quarry” behind where Homebase used to be. In 1900, G.W. Bacon’s Plan of Leeds marked “Harehills Quarries” between Harehills Lane and Bracken Edge, but these quarries may have closed after the purchase of the quarried land by Mrs E. Schunck from the James Brown Estate in 1887.The t915 – 1920 revision of the 6 in O.S. map however, noted “Harehills Quarry”on the east side of Gledhow Wood Road above where the Tesco store now stands, again with an inclined wagonway. Harehills Stone was noted as a very fine-grained compact and durable sandstone of a beautiful warm tint which “rejects the lichen in country districts”! It was slightly more difficult to work than Bath Stone, but easier than Portland. Laminae were seldom visible and the bedding often difficult to detect, although occasionally it was picked out by layers of small mica flakes. The workable stone lay about 4,25 – 4.5 m (14 ft to 15ft) below the surface of the ground. The top beds of all quarries consisted of “rag” stone averaging from 23 – 38 cm (9 in to 15 in) thick which was used for the foundations of second and third-rate buildings, only being removed to get at “block” stone beneath. 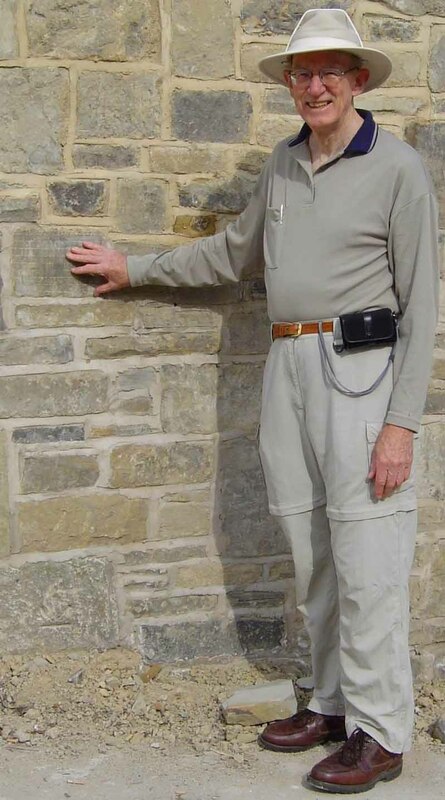 Below the “rag” stone was a 0.9 to 1.2m (3ft to 4ft) thick bed of flag or coping stone, not recommended for street causeways or for dwelling houses because it was too porous, but well adapted for copings and for slab chimney pieces. Beneath this lay the “block” stone for which the quarries were mainly valuable. 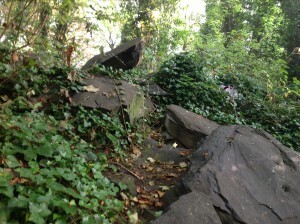 A feature of this “block” stone was beds dipping up to 30 degrees indicating rapid deposition in a deltaic environment. Occasionally blocks 1m (3ft) thick were quarried, but this was exceptional, 30 – 45 cm (12 in to 18 in) thick blocks being generally shaped for use. The thickest blocks were obtained from the lowest beds which Waterhouse noted had not been worked until recently because they were perpetually standing in water. In discussing the quality of Harehills Stone, Waterhouse noted that the quarries at Harehills produced uniformly the better stone, although the best beds at Gipton Wood were not inferior to any of those at Harehills. The lower and upper beds at Gipton Wood showed great disparity in quality. The lower furnished much better stone, but the upper were excessively soft and never proved durable. lt appears therefore that the lower beds through the area of quarrying were consistent in quality, but that the upper beds improved greatly as the outcrop of the Elland Flags was followed towards Harehills. in 1880 to 1834 to construct the Westminster Bridewell in Francis Street, Tothill Fields. At this time it must have been transported to London by sea. Four other uses of Harehills Stone in Leeds have been found. Stone from Gipton, among others was used for the interior and columns of the rebuilt 1837 – 1841 St, Peters Church in Kirkgate, and from Harehills Quarry in 1863 by George Cordon to build Hepper House in East Parade (Builder 1863, p. 424). with rubbed dressings and boasted (decorated with steeply inclined tool marks) wall stones (Dimes and Mitchell 1996, see Chapter 5.20 and Chapter 4, Walk 3, 61 ).The sandstone blocks of the upper floors of No. 14 Commercial Street, built by George Cordon in 1868 are decorated with Harehills Tooling marks (see below) and the stone was very probably from the Harehllls – Gipton Quarries, and Yates Wine Lodge 24 – 28 Boar Lane on the corner of New Station Street, was built by Thomas Ambler in 1867 with stone from the Harehllls Quarries (Christopher Hindle, personal communication). The three Oakwood mansions nearest to the Harehills and Gipton Wood Quarries (see Figure 1) are Gledhow Hall (c. 1764 – 1767), Allerton Hall (c. 1840, later Roundhay Hall and now the BUPA hospital) and Gledhow Hill (c 1842, formerly Birr House and Ethel House and now part of Roundhay School). 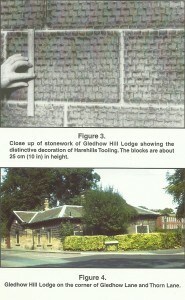 In the case of Gledhow Hill , there is evidence that Harehills Stone was used to build the house. The Sale particulars printed by Messes Hepper and Son at the time that the Ethel House Estate was put up for sale in 1876, noted that the dressed stone for the house was “to a large extent quarried on the estate, and that the celebrated Gipton Wood Stone not only underlies the whole of the estate but can be reached with comparativety little baring”. 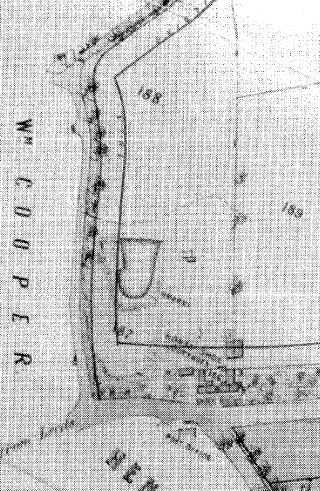 The most likely quarry for the stone is the one shown on the 1851 6 in OS map on the north side of Gledhow Lane approximately where the Kerr Mackie School now stands. These three important houses were built of fine-grained sandstone, almost certainly Harehills Stone, worked from local quarries. This would have been the nearest and most convenient stone to use. Being local, it would also have been the cheapest to transport at a time when this cost was a very important consideration. Many of the other early nineteenth century grand houses of the Oakwood – Roundhay area were also built of similar finegrained sandstone. 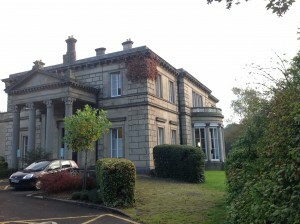 They include (see Figure 1) The Mansion in Roundhay Park (c. 1813), Eller Close (1820), The Grove (c. 1820) and Grove House (1831) in North Lane, the Lodge to Springwood House (c. 1827) on Oakwood Lane, and Oakwood House (late 1820s) now Sabourn Court. All these Roundhay houses probably used Harehills Stone and have stone work features in common. Beautifully cut and squared (ashlar) blocks with smooth rubbed surfaces were generally used for much of their main facades, but in each case parts of the sides and rear walls are built of blocks with a distinctive surface ornament, here referred to as HAREHILLS TOOLING (see Figure 3). The face of these blocks has been elaborately chiselled to form horizontal bands of shallow depressions about 2.5cm (1 in) in height and 3 – 4cm (1.25 – 1.5 in) in length. The effect is to produce a surface with an appearance like a small scale brick wall. Excellent examples of this decorative finish can be seen on the lodges of both Roundhay Hall at the northern end of Thorn Lane, and Gledhow Hill (see Figure 4) on the Thorn Lane – Gledhow Lane corner. In medieval times stone masons identilied their work with what were known as Masons Marks, and it is possible that much later, quarries may have dressed their blocks in an indlvlduat style to distinguish their stone from those of other quarries. Mr. W.A. Hopwood (personal communication) for example, has kindly advised that the nineteenth century Meanwood Quarry stone has a characteristic herringbone pattern of narrow punched tent marks. Blocks with this ornamentation can be seen on the Alms Houses at St John’s Church, Roundhay. It is here suggested that the fine-grained sandstone blocks with beautifully worked distinctive brick-like decoration (Harehllls Tooling) seen in some of the older buildings of Roundhay, may be a characteristic of late eighteenth and early nineteenth century Harehills Stone. The invaluable and fascinating account by Alfred Waterhouse confirms the evidence provided by the old quarries on the ground, and by old maps, that the Harehilis – Gipton Wood area for many years had a thriving and important quarrying and stone working industry. The fine-grained sandstone quarried from this area was from the Elland Flags and was known as Harehills Stone. The blocks decorated with the distinctive Harehills Tooling are thought to be characteristic of Harehills Stone. The use of Harehills Stone in central Leeds probably stopped after the 1860’s as the spread of railways enabled equally good quality fine-grained sandstone to be transported more cheaply into Leeds from quarries throughout West Yorkshire. The reasons for the decline in the use of Harehills Stone were complex, but lack of rail access would have been critical. However, quarries in Oakwood presumably continued to supply sandstones for the rapid spread of Harehills and Roundhay in late Victorian times. No information has been found about eventual closure of these once renowned quarries, but some probably continued into the 1930s. 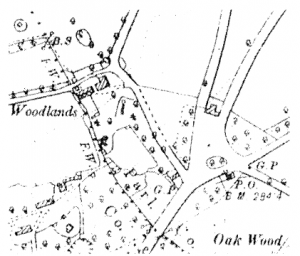 This account hopefully gives some idea of the former importance of quarries in Oakwood with all the associated bustling activities in the masons’ yards, and blacksmiths’ shops for sharpening tools, and with the horses and carts to transport the stones. lt may perhaps lead to more information being uncovered and the author would be delighted to hear from anyone with memories, records or photographs about the Harehills and Gipton Wood Quarries and Harehills Stone. Jerry Hodgson is thanked for drawing Figure 1. DIMES, F.G. and MITCHELL, M. 1996. The Building Stone Heritage of Leeds. The Leeds Philosophical Society, Leeds. LAKE, R.D., NORTHMORE, K.J., M.T. and TRAGHEIM, D.G. 1992 Leeds: A geological background for planning and development. British Geological Survey Technical Report WA/92/1. In Oak Leaves, Part Two (2001), (above) Murray Mitchell wrote extensively about the quarrying in the Oakwood area and mentioned how little information seems to have survived about this industry which was so important to the area in the 19th century. Recently I have come across a few references to quarries in the Roundhay Park Estate which I think are worth recording briefly in Oak Leaves. In the Hepper’s sale details of the auction in 1871 at which John Barran acquired the Park Estate for Leeds Corporation, two quarries were listed in the lots he bought. 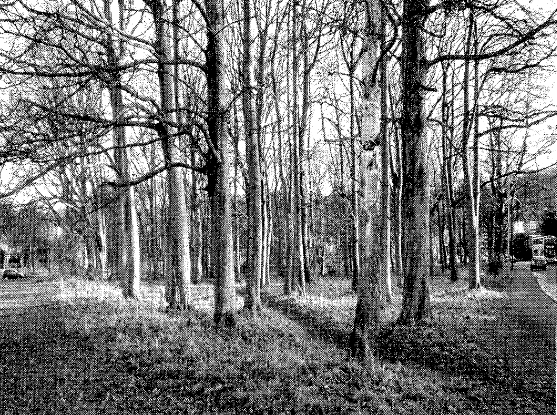 One was not far from the Cobble Hall farm buildings, but perhaps more interestingly,, the other quarry site was in the small wood at the edge of the Park at Oakwood. I wonder how many people know today there was a quarry here during the early years of Roundhay Park in public ownership? Site of a former Quarry. 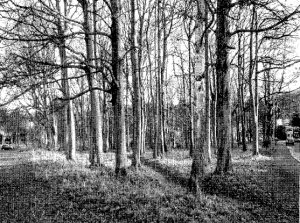 The Wood on the edge of the Park next to Gledhow Lane at Oakwood. The following year the Sub Committee received a letter from a Mr B Kyne about “the dangerous state of the old Quarry at Horseshoe Corner” (i.e. at Oakwood) so they gave instructions to have the quarry fenced off ‘and a notice put up warning the public against getting over the fence or bathing in the water.’ At that time, the roads through the Park Estate, Park Avenue, West Avenue and Prince’s Avenue were being constructed and the Sub Committee proposed that stone from the Oakwood quarry should be usednfor the road foundations and ‘for a bridge’. In 1877, the Subcommittee resolved to fill in the quarry ‘as soon as possible’ so I was surprised to find that in 1882 they were informed that ‘night soil’ had been deposited in it. Even more surprisingly, ten months later in January 1883, the Town Clerk laid before the Committee a Notice received from the Inspector of Nuisance requiring the removal of the Night Soil Ashes and vegetable matter deposited in the Old Quarry owned by the Corporation near the Post Office at Roundhay.’ Two members of the Committee were appointed to see the Inspector and authorised to take such action as they considered appropriate. I have found nothing further about the Quarry at Oakwood but the OS map of 1892 shows the quarry had been filled in by then. We are interested in hearing from anyone with information about the quarrying that took place in the Oakwood area or from current members of families who had relatives working in the quarrying industry in and around Oakwood.